The Xamarin.Forms Autocomplete entry control provides suggestions to select from as you type. Supports multiple selection, filtering, tokens, header and footer view and more. 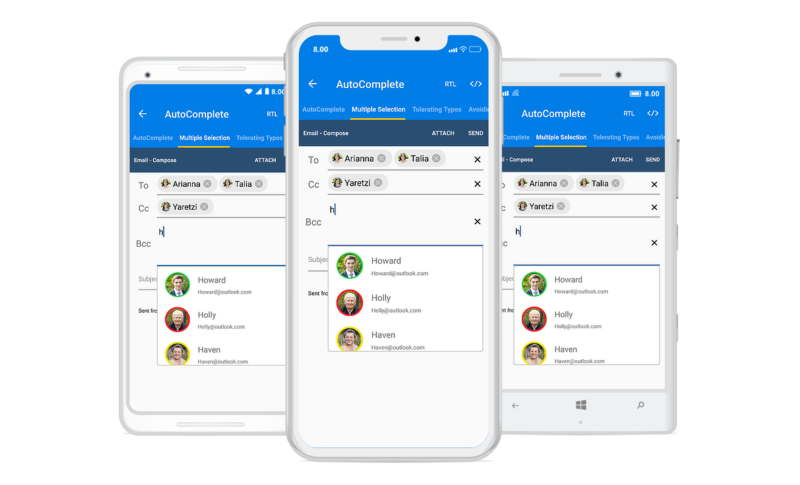 The Xamarin.Forms Autocomplete control is highly optimized to quickly load and populate suggestions from a large volume of data depending on the user’s input characters. The Autocomplete control allows the user to select one or more items from the suggestion list. Select multiple items from the suggestion list and display the selected items either as tokens, such as in an email address bar, or text separated by a delimiter. The Xamarin.Forms Autocomplete control has been designed with performance in mind in every aspect. It has several optimizations that allow users to load and search a million items in an instant. When a character is entered, the control searches for items related to the entered character and filters the results, displaying suggestions in a drop-down list. On demand loading - If there are more filtered items than can be viewed, there is no need to worry about populating them. Instead, limit them by using one of the built-in options, and load more if needed by providing a load more button. Diacritic sensitivity - The Xamarin.Forms Autocomplete control does not stick to one type of keyboard, so you can suggest characters from a language with letters containing diacritics and search for them with English characters from an en-US keyboard. Custom search - Apply your own custom search logic to implement functionality like custom typo toleration that provides suggestions based on the input characters. Perform filtering when needed - The Xamarin.Forms Autocomplete control starts offering matches as soon as users start typing, but supports a provision to set the number of characters required to start matching. Filter - You can pick from various filtering options such as starts with, contains, and ends with. You can also choose whether to filter with or without case sensitivity. The Xamarin.Forms Autocomplete control suggests a list of filtered items in a pop-up or appends the rest of the suggested word in the input area. When the user starts typing in the Autocomplete control, a pop-up opens, displaying the filtered items that match the entered text. Pop-up placement - Show the suggestion pop-up either at the top or bottom depending on the size constraints. Avoid suggestion pop-up - Allows you to collapse the built-in suggestion pop-up and show the suggestions in other items controls, like the ListView. Pop-up opening delay - Delay the opening of the pop-up. Show suggestion on focus - Display all the suggestions in the pop-up whenever the Xamarin.Forms Autocomplete control gets focus. Highlight the matching text of each filtered item. Localize all static text content with the required language. Explore the full capabilities of our Xamarin controls on your device by installing our sample browser applications from the matching app stores.